Digitalis parviflora is a rare species from Spain. It blooms in early summer with small, reddish-brown flowers. The narrow, evergreen leaves have white veins. 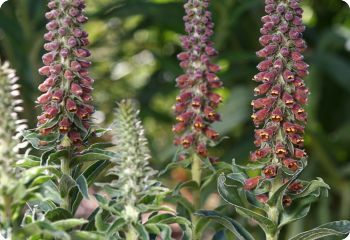 Digitalis parviflora 'Milk Chocolate' is a subtle plant that needs a position near the front of the border where the intricate flowers can be observed up close. Also known as Milk Chocolate Foxglove. Deer resistant. Long-lived, hardy perennial in zones 4-9.